April Fools Day I was trying to think of something funny to pull on this page but nothing came to mind, so it's on to the boat stuff. We have gone from 70 degrees on Saturday to snow on Sunday and back to 70 today!! I'm glad I'm building this boat instead of cruising on it last weekend. We got the roof trimed and the insulation and ceiling paneling installed. 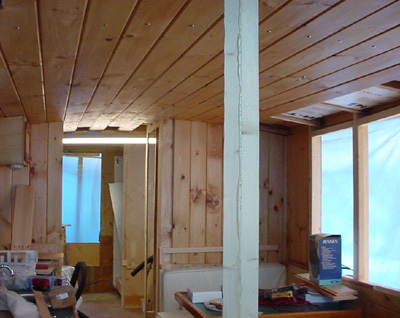 The knotty pine looks good and makes the cabin appear longer than it is. I epoxied the rear cockpit floor in preperation for installing the 50 gallon fuel tank under the back deck. We also spent a day getting the water tanks figured out and tied down. I used ratchet tied downs with custom mahogany blocks epoxied and screwed to the floor and it feels very secure. Each tank holds 35 gallons for a total of 105. That much water should allow us to stay away from the dock for a few days if we want and still have plenty of water to use. 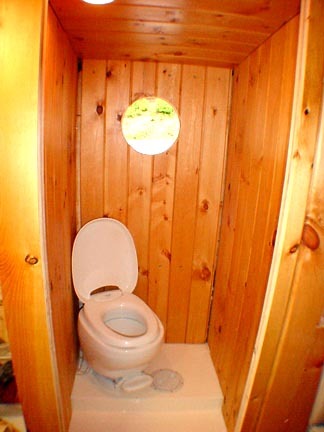 The head will take only a pint per flush. I am hoping to get 5 days on the hook before we will need to tie to shore. Food or laundry will be our limiting factors. Things seem to be moving along well and I think I see a completion in the future. We are hoping to launch on July 5th, a day after our daughters wedding on the 4th. Between the two I may be looking for handouts for fuel. 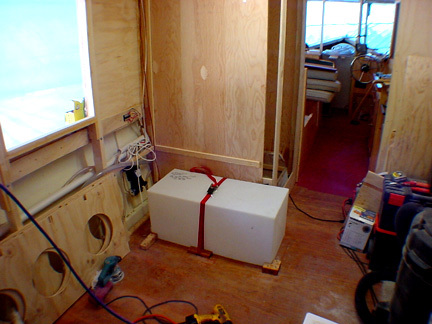 We still lack the fridge and the outboard but other than that it's mostly small stuff. 4/09/03 April 7th was a year since we started this project!! It's taking about what I had figured and is even a little bit ahead of schedule. Not much happening this week. I went fishing at the coast for a few days and picked up some parts at the boat stores while I was down there. Winter has returned with a vengence it seems. This Saturday is supposed to get a lot warmer so we will work on the boat then. I was hoping to get up a photo with my new wide angle lens for the digital camera but until I get done working on hooking up the water tank under the booth seat the photo will have to wait until I clean up the mess. I did get the Xynole and epoxy on the port side of the cabin last week. It's been too cold to get out in the shop and sand it all down. I'm eager to get the outside of the boat painted or at least primed. I've had the Interlux Old Hatteras off white to go on the hull since last year but haven't had the right weather to put it on. The white in the photos is the primer. I've run into the hull with ladders, tools, and plywood enough to say that the Interlux epoxy primer is very tough stuff. 4/14/03 Nature has a way of making up the rules here in the mountains. Last Friday we had a lot of rain, not all that unusual for April, but it has changed our way of life for a while. The highway that runs from our house past our shop where the boat is located and into Lenoir where we work had a landslide that the State Highway Dept claims will keep the road closed for a month. Our 6 minute round trip commute to the boat is now over 2 hours!! We are thinking of staying in the camper for a few days to avoid the long trip round the mountain. I feel like we live on an island even though the highway I refered to is a federal highway that connects the high country to the rest of the world. However, we did get to work on the boat over the weekend and got the water tanks straped down and the water pump in. 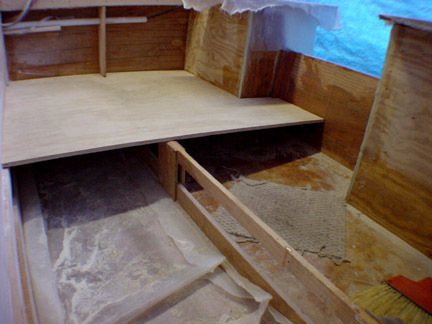 The picture shows the tie down strap and all of it will be covered by the bed eventualy. We also glassed the outside of the rear cabin bulkhead in preperation for priming this week. We hope to tackle the roof before it gets too hot. 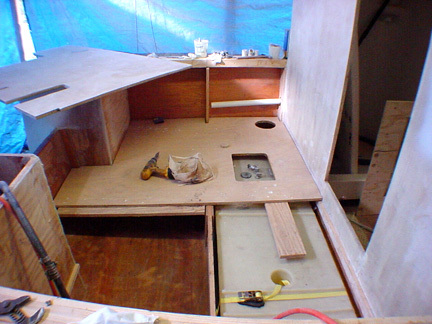 4/21/03 We were able to spend a lot of time working on the boat over the Easter break. 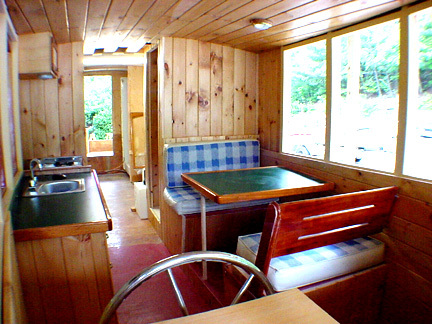 Cut out the portholes in the cabin sides. Sanded the entire roof in preperation for epoxy. We didn't get to prime anything as intended due to some cool weather, maybe next week. I got my first glimpse of the Old Hatteras Off White Interlux paint that we will be using on the hull. I painted around the holes for the 2 thru hull drains, both above the waterline, so we will get a better finish around them after they are installed and the rest of the hull painted. The Interlux is great stuff. It dried to a high gloss mirror finish even though I did it at dark on a cool, rainy night with a brush. I figure if it looks this good under these adverse conditions it will look fantastic when I use the sprayer on a warm day. I figured out the two way seat for the booth. It will be easier to put up a picture next week than to try and explain. I think all the mahogany will look good. Got the fabic for the cushions in the booth. Hooked up both drains, shower and sink, so I can start on the bed next. I think the water systems lack hooking up the vent lines and we will be able to take a shower and wash dishes. That July 5th launch date will be challanging now that I look at all that needs to be done but we are still hoping............ 4/27/03 The epoxy and xynole on the roof is done except for the filler and a lot of sanding and paint. Started working on installing the fuel tank and floor in the back cockpit. I get to work 4 days this week on the boat and am getting a lot done with all the warm weather we are having here. Had a batch of epoxy go off before it all made it on the boat. That hasn't happened since last summer but I'm glad for the high temps anyways. I also got the lids to the holding tank in the head cut and epoxied today. I hope to get the head finished as soon as the tank is done. We spent the weekend finishing up the sanding of the epoxy on the roof. I also decided that with the sanding done we may as well put on the primer. I will need to go back and sand the roof again and fill all the small air holes that were in the filler that showed up when the white primer went on. It's supposed to get cooler this week but I should get some time in on the boat. 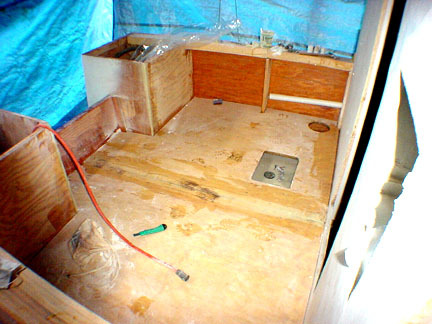 The new pictures show the rear cockpit floor as it went in the boat. The cutouts are for inspection hatches that will allow access to the fuel tank fittings and to check for any water or fuel leaks below the deck. The other shot is of the holding tank in the head with the top on. 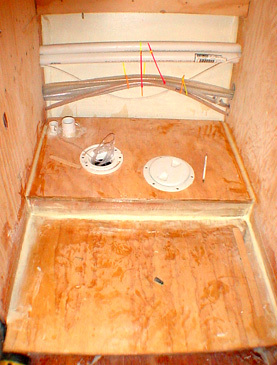 You can see the fittings for the clean out, vent pipe, toilet flange and inspection port (which I hope to never open). I also installed a bubbler strip like you find in aquariums that will hook to a small pump in case we have any odor problems. I expect a fair amount of natural aireation from the movement of the boat but time will tell how it all works out. The port side deck is glassed and filled and the head is almost done. I ran out of pine for the walls in the head and epoxy for the other side deck but all should be done by the weekend. The highway appraisers spent the day with me looking over the property for the new highway so I don't expect to have the shop next Christmas. . It's been the perfect place to build this boat with all the space and close to home. I'm back to a 3 minute commute now that the highway is open again. The same road will take our home later this year. I'll really miss our 50 mile view off the back decks. Maybe I'll post a picture of the veiw I wake up to every morning. I've been busy glassing the starboard side deck and getting the paneling up in the head. The head is almost done. Picture soon. It's starting to look like we will need to push back the launch date. 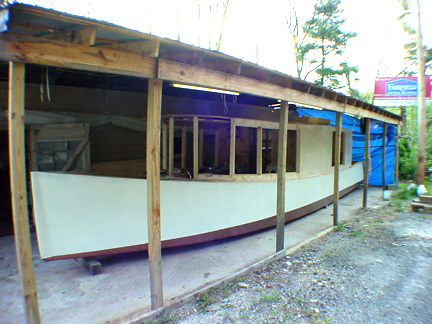 We were hoping to launch in early July but as with everything in boat building, it takes twice as long as you expect and costs twice as much. I still hope to get it in the water in July but our daughters wedding will take some of our time in late June and early July. As this is our first wedding since our own, 27 years ago, we hope to have a good time without the stress of launching a new boat the next day as planned. It took 12 hours to turn over the hull and I hope it doesn't take as long to get it on the trailer and to the lake but these things have a way of fooling you. water tank under the bed. holding tank with top on.